Adding to the long list of artistic activities that can be seen throughout the summer season in different public spaces of the city, Milonga Anichi and the art collective "El Milongón", are organizing the 9th Edition of the Tango Encounter "Milongueros de Corazón ", an event that will feature the participation of teachers Carlos Espinoza, Coca Cartery and Celeste Medina. 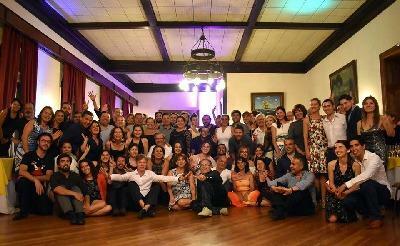 Great masters of Tango, who tour the best festivals in the world doing exhibitions and giving tango seminars. To light the nights of Milonga we invite the internationally recognized, Gabriel Sodini, Cristian Sierra, Sergio Segovia and Ana Mª Cepeda. CARLOS ESPINOZA * Tango Seminar * with Maestro Carlos Espinoza Carlos Espinoza, also known as "Che Carlitos", is an undisputed protagonist of the tango of recent times. His first steps were in El Bolsón, Argentina. As a result of the artist's obsessive desire for research, sacrifice and discipline, Carlos began at an early age to succeed both in dance and in his classes. Today he is considered one of the best dancers of the Tango avant-garde, and as an artist he has added a new piece to the huge mosaic called Tango. It has acquired a solid reputation throughout the world, often on tour, in Europe, Asia, North-Central and South America, particularly since 2001. His style of dance combines the tradition of classic style tango salon, with the beauty of his closed embrace (milonguero), an impeccable musicality, as well as a unique dynamic. All women want to dance with him. CELESTE MEDINA * Tango Seminar * with Maestra Celeste Medina Celeste Medina is a professional dancer of Tango Argentino, born in La Plata, one of the provinces of Buenos Aires. The Argentine tango has been his way of life for the last 20 years. Her exquisite technique and interpretation have led her to a successful career in the most prestigious stages around the world. He gives lessons and demonstrations in France, Spain, England, Brazil, the United States, Turkey, Japan, Thailand, Italy, Switzerland, Germany and Russia. In Buenos Aires, he worked in the most famous tango shows, such as Señor Tango, Viejo Almacén, Tango Porteño, Piazzolla Tango, Central Tango among others. He toured the world with renowned companies such as "Tango Fire" and "Una Noche en Buenos Aires" in Australia, Chile, the United States and Brazil. Celeste also participated in the renowned company "For Ever Tango". The Technical class It is focused on women of all levels and men who want to learn from the female role to improve their dance. The structure of the class has as its main framework, posture exercises, dissociation and balance. The variants of these exercises allow to work, also, coordination, speed and dexterity. The adornments are always included, as well as the walk and the basic elements of the dance (eights, turns, pencils). For these, we perform specific exercises, designed especially for each one of them. The work of musicality is part of each of the exercises and is developed throughout the entire class. -Dance shoes with medium or high heels. Classes will start on time. We thank the participants for arriving 5/10 minutes before each class. INSCRIPTION Registration will be open from November 1 to January 1. ARE YOU GOING TO MISS IT!! !